Traditionally, we view career growth in a linear progression; but for the Millennial generation, professional journeys are more commonly taking a non-linear or “meandering” path. For Deepak Shukla, founder and CEO of the SEO agency Pearl Lemon based in London, the meandering path was not just a byproduct of his curiosity, but an incubator for personal and professional growth. By the time Deepak was in his mid twenties, he had already had 23 or so jobs. 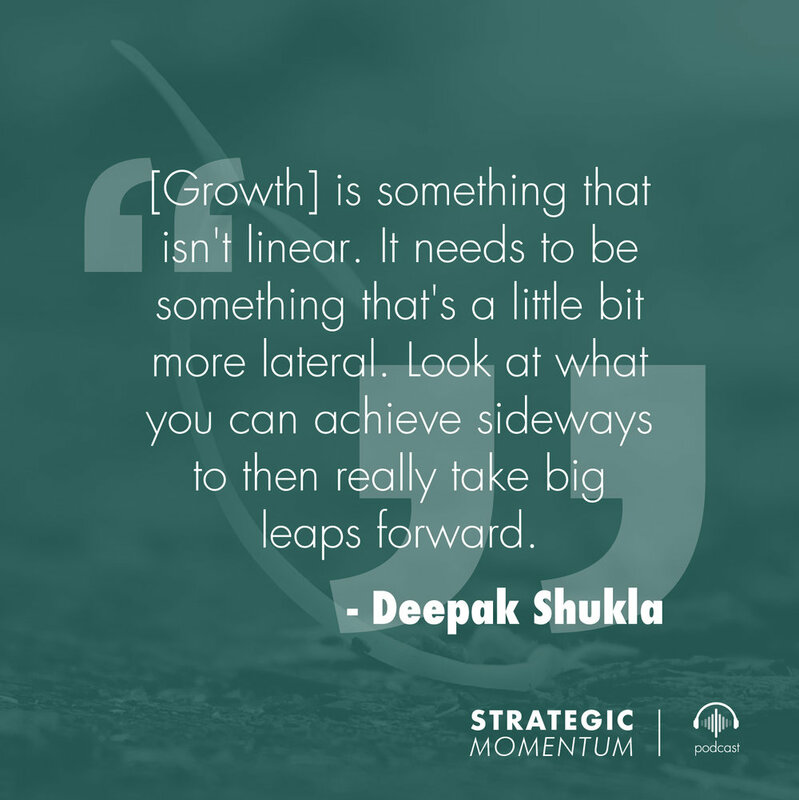 After art school and working as a tax consultant, running a recording studio and a tutoring company, and even spending a year training with the British Special Forces, Deepak recognized that he could pivot and that pivoting was a real thing. As a result, this ongoing “discovery or reinvention,” as he liked to call it, accelerated his skills development and helped him find his value and passion for marketing. Many factors can lead to stagnation in your career. Sometimes, it’s waiting for your calling to come to you instead of actively seeking it. Other times, it’s spending too much time reading and researching, and not acting. However, the leading inhibitor holding people back from taking risks that could accelerate their careers is fear of failure. So by sharing your fears out loud, you invite inadvertent collusion from others, which reinforces the need to stay in a safe place. For Deepak, the trick is to activate the fear in a way that supports your growth by attaching a negative incentive to not taking the risk. He quotes Tony Robbins: “Change often comes when the fear of remaining the same becomes greater than the pain of change." By establishing a negative consequence, you create motivation and accountability for seeing the risk through, no matter what the outcome. The only way to truly carve a path to success is to experiment first-hand, which means acting on impulses and not overthinking. The broad experiences that one can have – whether it's through travel, trying different technologies, or just experimenting in different areas – can ultimately come back and make you a more productive, efficient, and potentially more creative in whatever you choose to pursue. And it’s essential to create anchors along your path to keep your momentum moving in the right direction as you continually experiment and learn – a test and learn approach to living life. In the end, you’ll find that the more risks you take, the more fearless you become, and the closer you get to finding your calling. Fear of failure is the biggest inhibitor to career growth. Expressing your fears creates opportunities for reinforcement through collusion. Instead, activate fear in a way that supports your growth. Give yourself a goal and do something or tell someone who will hold you accountable. You can even attach a negative incentive to failure, such as a monetary loss, to motivate you to work towards your highest value. “If you want to go to places you've not yet been, you have to do things that you've not yet done.” Look for outside opportunities to be your shortcut to progress. Open yourself up to sources of advice that are different from where you have traditionally received it. They may not have done what you’re setting out to achieve. Further, directly following in somebody else's shoes could inhibit you from achieving the goal in the way that you want to. Break through the inertia by doing something that ventures into your “stretch zone.” Create anchors along your journey. These are standards and expectations you use as an anchor to guide your growth. By creating accountability, you can stay motivated to stick with your plan. When you have an impulsive moment, take action and don't overthink it. Once you can get used to doing things outside of your comfort zone, you’ll fight fearfulness and start acting in ways that ultimately support you.